Don't forget to consult our extensive archive of Books & Articles. Support FDI by making your purchases at Amazon.com. Anything you buy within 30 minutes of clicking on the links below will help us. FDI updates now on Twitter. for the Nobel Peace Prize 2006. Read the latest Mideast headlines here. Nov. 17: FDI joins Larry Klayman and Freedom Watch to examine policy options for the incoming 112th Congress toward Iran. FDI briefs incoming House intelligence committee member Rep. Michele Bachmann on Iran. Dec. 27, 2013: Zarrab family granted Turkish citizenship. In the deepening corruption scandal enveloping the government of Turkish Prime Minister Tayyip Erdogan, Iranian businessman Reza Zarrab has reportedly succeeded in acquiring Turkish citizenship "on exceptional grounds" for his immediate family. "Applicants can acquire Turkish citizenship on exceptional grounds after getting a nomination from the Interior Ministry and a decree from the Cabinet," according to Today's Zaman, a Turkish news site. Dec. 25, 2013: Turkey Corruption Scandal Hits Iran. The corruption scandal that has caused three government ministers to resign and threatens to ensnare Turkish Prime Minister Tayyip Erdogan began when police investigators alleged that Iranian businessman Reza Zarrab had bribed public figures in Turkey. “Zarrab exports gold and I know he is involved in charity activities as well,” Erdogan told a rally in Istanbul, in an attempt to dismiss the growing scandal. Zarrab told prosecutors"his chief" in Iran was "B.Z," widely believed to be Babak Zanjani, th e Iranian billionaire sanctions-buster who has been blacklisted for sanctions violations by the U.S. Treasury department. 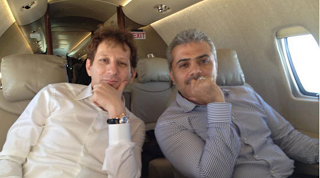 (In the photo at right, Zanjani can be seen in his private jet (wearing a white shirt) along with Hassan Mir-Kazemi, a bassiji "businessman" better known for getting photographed on a motorbike with his pistol during the repression of the 2009 post-election protests). Police also arrested the general manager of the state-owned Halkbank, Suleyman Aslan, on allegations of illegal gold trading with Iran. “I have no doubt that he [Aslan] is innocent,” Erdogan added. Halkbank was at the center of a murky deal to transfer hard currency payments for Iranian oil, blocked by international sanctions, by Indian oil refiners. Also known as Turkiye Halk Bankasi SA, Halkbank is controlled by Erdogan’s AKP party. Union Bank of India, the Indian bank that had been remitting payments for Iranian oil, contracted with Halkbank in August 2011 to serve as an intermediary for the payments, using a complex currency transfer mechanism designed to get around the U.S. financial sanctions. Suspicious gold and currency transfers involving Iran and Turkey first came to light in October 2008, when the Turkish authorities seized a container said to contain $18.5 billion worth of U.S. dollars and gold bullion, originating in Iran. The suspicious shipments continued into at least January 2013, when a mysterious cargo plane originating in Ghana made an emergency landing at Ataturk Airport in Istanbul and was discovered to be carrying 1.5 tons of gold, worth an estimated $1 billion. Dec. 12, 2013: IRGC commander says "no red lines have been crossed" in nuclear negotiations. Maj. Gen. Mohammad Ali Jaffari said that Iran has already "given the maximum" in nuclear talks with the West and "received the minimum," but noted that so far "no red lines have been crossed." This is a clear reference to IRGC demands that Iran never give up uranium enrichment. Jaffari also acknowledged once again the IRGC presence in Syria. "We have announced before that we have specialized forces in Syria to transfer experience and training who undertake advisory roles, and this is obvious.” Jaffari's comments initially came as a challenge to Foreign Minister Javad Sharif, who claimed Iran could be destroyed with two [atomic] bombs, something Jaffari disputed. “Today, Iran is a completely secure country from a security issues view. The enemies knows our capabilities in several dimensions of materiel and software. Since  we have been in an asymmetric battle with the enemy. They saw Iran’s abilities in the 33-Day and 22-Day Wars against an Zionist army armed to the teeth," he added. English translation via AEI's Iran Tracker. Persian from FarsNews. - Khatami advisor adds: Nuclear agreement is the "Treaty of Huddabiya in Geneva." If any doubts remain as to how the Iranians see the Geneva agreement, this statement from political commentator (and former Khatami advisor) Mohammad Sadeq Al-Hosseini should set the record straight. Iran's missiles can now reach Tel Aviv; Obama was desperate for a handshake from Rouhani in New York, and the nuclear agreement was like Mohammad's temporary treaty of Huddabiya, made to be broken once the Muslim side was strong enough for military victory. 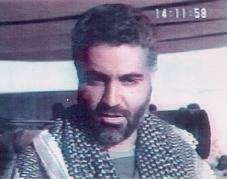 Read a translation of his Syrian TV interview thanks to Memri.org. Dec. 7, 2013: Basijis infiltrate student protest. Basijis posing as students infiltrated a student gathering at Tehran Polytechnic University on National Students Day today, "intending to undermine the gathering," according to Ghanoon Online (via the AEI Iran Tracker). "The Basijis led chants of 'Allahu Akbar' [God is great], and 'Down with America.' The resident students’ chants included 'Political prisoners must be freed,' Ghanoon reported. "A student who attended the rally said that 'At 11 o’clock, non-student individuals were dispatched to the university by bus. Extremist members of the Basij from Amir Kabir University arrived by the hundreds and led chants saying that political prisoners must be executed and that Rouhani must let go of student life.'" FDI Comment: this is just the latest example of the regime's robust counter-intelligence operation to infiltrate, mislead, misdirect, and confuse opposition elements inside Iran. But it also demonstrates the regime's ongoing fears of renewed protests. Dec. 6, 2013: Khatami brother shows Iran's escape clause from nuclear deal. Speaking at Friday prayers in Tehran, Hojjat-ol eslam Ahmad Khatami, the brother of the former president, praised the regime's team of nuclear negotiators for sticking to the Supreme Leader's script. Then he described Iran's escape clause. “After the negotiations, Obama again noted that all options are on the table. He lied and said that we have an atomic bomb. What manners are these? We know that Obama is among the rudest leaders in the world. However, if there is the smallest indicator of a lack of adherence, the Quran says that you cancel the contract, and that if the enemy wants to betray you, there is no contract.” This reference to the famous "huddabiyah" contract Mohammad signed with Jewish tribes in Mecca served Arafat in signing the Oslo "peace" agreement with Israel, which he consistently violated, and is now being invoked by Iran. Nov. 24, 2013: FDI calls the P5+1 nuclear agreement with the Islamic Republic of Iran "a sham" FDI has carefully examined the public data on the nuclear agreement between the P5+1 and the Islamic Republic of Iran. While we applaud the efforts of French Foreign Minister Laurent Fabius, who held the line on a much worse deal at the previous round of negotiations, the deal announced today will imperil the security of the Iranian people, the region, and will inevitably lead to war. Why? Because it allows the Iranian regime to maintain its nuclear breakout capability, imposes little in the way of serious verification, and thus serves as an encouragement to continued cheating. In exchange for immediate sanctions relief offered by the United States and Europe, Tehran offered promises to limit centrifuge production, to delay construction of the Arak plutonium production reactor, and to suspend 20% enriched uranium for six months. Some deal. In addition, FDI sources indicate that the Iranian regime continues to work on ICBM capability, including a MIRV'd delivery vehicle capable of carrying five warheads (three nuclear, two decoys). While fissures in the production of the missile casing have delayed the program, the agreement imposes no limits on this program. We fully subscribe to the statement issued by UANI Chairman Ambassador Mark Wallace that condemns the nuclear deal for not including any rollback of Iran's nuclear weapons ambitions. We also note that Ayatollah Khamenei views these negotiations as a subterfuge to attain the Islamic Republic's true goal of acquiring a militarily-significant nuclear arsenal for a first strike on Israel (see Nov. 20, below). Nov. 21, 2013: "Moderate" Rouhani's defense minister help ed murder U.S. Marines in Beirut. Hossein Dehghan, Rouhani's new defense minister, cut his teeth in Lebanon, where he helped forge Hezbollah into an operational arm of the IRGC. In the early , according to Israeli researcher Shimon Shapira, he helped recruit Imad Mugniyeh and devised the plan Mugniyeh carried out to blow up the U.S. Marine barracks at the Beirut airport on Oct. 23, 1983, killing 241 Americans, and simultaneously attack the French Marine barracks several kilometers away, killing 63 Frenchmen. The AP photo at right shows Dehghan in the Majlis recently. Read the full story from Tony Badran at the Weekly Standard. Nov. 20, 2013: Khamenei says nuclear talks are a sham. In an address to Bassiji commanders, the Supreme Leader of the Islamic Republic warned that any interpretion of Iran's "flexibility" in the current nuclear talks with the great powers was "a misunderstanding." "Heroic flexibility" is a term many in Iran have used to suggest that President Hassan Rouhani was behind the nuclear deal with the West. Khamenei set them right: "'Heroic flexibility' means an artistic maneuver and the use of different tactics to reach different goals and ideals of the Islamic regime,” he told the Bassiji commanders. Khamenei reminded them that Iran's "right" to enrich uranium was a "red line" that Rouhani's negotiations would not cross, according to an account of Khamenei's speech by FDI Strategic Information Program director, Reza Kahlili. Oct. 23, 2013: Iranian regime Announces International "Down with America" award. Now that the U.S. and Iran are talking again, everythings going to be okay, right? 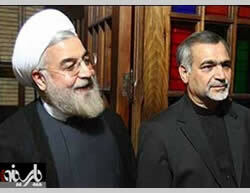 After all, didn't Khatami and Javad Sharif, the smiling mullahs, say there would be no more "death to America?" So now it's just "down with U.S.A."
The regime's hacking squad, "Cyber Hezbollah," has claimed responsibility for attacks on U.S. government websites. Now they are holding the "Great Conference of Down with U.S.A." in Tehran on Nov. 2 and sponsoring a "Down with U.S. Great Award." To plug the contest, they registered a new website using a Queensland, Australia proxy, PrivacyProtect.org. Sanctions anyone? For more, read today's column for FDI Strategic Information director, Reza Kahlili. Oct. 19, 2013: AI Monitor carrying water for Iranian regime. Our friend Hassan Dai presents an illuminating analysis of AI Monitor's Barbara Slavin and her role in helping Rouhani and Javad Sherif trick the West into believing that hard-line comments from the regime leadership on the nuclear negotiations should not be taken seriously. In 2003, when serving as Iranian ambassador to the UN, Zarif played a similar game using Swiss Ambassador to Iran Tim Guldimann, Congressman Bob Ney, and Trita Parsi... Now the conduit for these authorized (and completely misleading) leaks is AI Monitor's Barbara Slavin. Oct. 18, 2013: Listen to Iran's dissidents before believing the nuclear lies. As negotiations resumed this week in Geneva over Iran’s nuclear weapons programs, Iranian regime officials have taken an increasingly hard line, making it unlikely any progress will be made absent significant U.S. concessions. Before Secretary of State John F. Kerry is tempted to give away the store in order to achieve a Pyrrhic victory, he would do well to listen to the voices of those the regime in Tehran has tried so hard to silence: its political prisoners. Among the most prominent is a dissident Shiite ayatollah, Seyyed Hossein Kazemeini Borujerdi, who has been imprisoned and treated with ruthless brutality for the past seven years. What was his crime? Refusing to aocknowledge the role of Islam in politics, and rejecting the doctrine of absolute clerical rule, the founding belief of the Islamic regime in Iran. Read more in today's Washington Times. Oct. 17, 2013: Rep. Trent Franks offers new legislation to enforce "responsible" nuclear agreement. Arizona Republican Rep. Trent Franks is a staunch advocate of human rights and religious freedom. Today he has offered new legislation, the U.S.-Iran Nuclear Negotiations Act, H.R. 3292, to require the Obama administration to negotiate verifiable benchmarks with the Iranian regime. The Act requires that any nuclear deal include an end to Iran's uranium enrichment activities, the dismantling of Fordo, and an end to the plutonium-production reactor in Arak. Here is the text of the bill. Shades of the Godfather: Quds Force chief appears with top regime leaders at his mother's funeral. Sept 29, 2013: Obama talks hostages with Rouhani. A "senior administration official" told reporters over the weekend that President Obama asked Rouhani about the fate of three Americans currently held hostage by Iran: Robert Levinson, Saeed Abedini, and Amir Hekmati. Michael Ledeen has more about the administration's desperate outreach to the (latest) smiling mullah of Tehran; Newsmax analyst Fred Fleitz asks if Obama is "repeating past mistakes" on Iran. Sept. 24, 2013: Quds Force chief said to be directing Assad's war in Syria. New Yorker magazine profiles Qassem Suleimani, (photo, left) the elusive chief of the IRGC's foreign expeditionary and terrorist Quds force, said to be providing strategic advice as well as manpower to the Assad regime. Our take: Ayatollah Borujerdi represents a body of senior traditionalist clerics who reject political Islam, which the U.S. administration of Barack Obama has embraced from Tunisia to Afghanistan. That perhaps explains why the U.S. administration has ignored his plight, preferring the fool’s errand of negotiating with a self-avowed liar, President Hassan Rouhani, who boasts of how he tricked the West as Iran’s nuclear negotiator from 2003-2005. FDI began writing about his plight not long after his arrest. His supporters are worried that long years of brutal detention, and the refusal by the regime to allow him to take heart medecine brought to him by his family, is contributing to his rapidly-deteriorating health. Sept. 22, 2013: The "containment" trial balloon. Former Clinton administration national security official Kenneth M. Pollock is again floating the containment trial balloon: don't worry about the Islamic Republic getting the bomb, just be prepared to prevent them from using it. As always, such analysis misses the point as to why the regime is seeking nuclear weapons capability, and the end times ideology driving Ayatollah Khamenei and his top advisors. Sept. 4, 2013: JINSA task force report on Iran. Without a doubt, this is the best and most authoritative analysis and set of policy recommendations we've seen. The list of participants include hard-liners on Iran as well as advocates of accomodation; and yet the report comes down squarely on the side of a more rigorous policy toward the Tehran regime with verifiable benchmarks. Our main regret: human rights, political and religious freedom get short shrift - indeed, no mention at all. Of especial interest for scholars and columnists is the list of nuclear offers made by the U.S. and the EU to Iran since 2005 - no fewer than seven complete package deals, several of which would have allowed Tehran to continue enrichment, a very bad idea in our view. July 18, 2013: Pro-Tehran lobby finds more "useful idiots" in Congress. The pro-Tehran lobby is salivating at the possibility that the election of a smiling mullah in bed with the Islamic Republic oil lobby will pave the way to back door deals with Iran that will make them rich. Key to that strategy is convincing their supporters in Tehran that they can deliver support for rapprochement and an end to sanctions in Washington. Our take: This latest letter, co-sponsored by Republican Charlie Dent of Pennsylvania and Democrat David Price of North Carolina, demonstrates why voters need to elect responsible adults to Congress. The U.S. has "engaged" the Iranian regime in dozens of meetings over the past decade, and the Iranian side has successfully delayed, denied, and deceived as they continued to spin the centrifuges and, through their lobby, Congress and the U.S. media. July 1, 2013: State Department negotiating Iran sanction waiver. As the U.S. Senate was engrossed in the immigration debate last week and the House was preparing for the 4th of July recess, the State Department quietly negotiated a deal with the Islamic Republic of Iran to establish direct flights between Tehran and New York, FDI has learned. The deal involves a government to government Memorandum of Understanding (MoU), and flights between the two countries operated by Iran Air, which is on the Treasury Department’s list of Specially Designated Nationals and banned from all commerce with U.S. persons because of its involvement in terrorism and the proliferation of weapons of mass destruction. In a special advisory delivered this morning, FDI urged the appropriate committee chairmen and ranking members in Congress to immediately clarify with the State Department whether they have indeed negotiated an MoU with Iran, as the Iranian Foreign Minister announced last week (see our complete statement, here); and if so, to withhold funds from the State Department for the implementation of this MoU or further negotiations. June 13, 2013 - Election update: Wealthy Los Angeles landlord pulls out from regime elections. FDI has learned that Frank Rahban, a wealth real estate investor in Los Angeles, is the owner of the building the regime planned to use tomorrow in Santa Monica to hold its “election” show, located at 401 San Vincente Blvd. Mr. Rahban encountered public notoriety in 2009 when anti-billboard activists protested in front of his Brentwood home because he had used one of his properties to host a 6-storey billboard. He owns the Santa Monica property through a family trust with his wife and son. California commercial records show that he operates Overland Investment Company on W. Pico Blvd, and is a partner or investor in at least five other real estate partnerships. After receiving a torrent of calls from angry Iranian-Americans on Thursday, Mr. Rahban apparently canceled the rental agreement for his property and the Iranian Interests Section has removed the address from the list of active polling stations on its website. Thanks to all who called! PLEASE DOWNLOAD AND DISTRIBUTE OUR ELECTION FACTSHEET. June 13, 2013: Iranians chant anti-regime slogans at football match. A brief video has surfaced of football (soccer) fans chanting anti-regime slogans at Tuesday night's Iran-Lebanon World Cup qualifiying match at Azadi stadium in Tehran. (Iran beat Lebanon 4-1). "Nah Ghazzeh, Nah Loobnan, Janam Fedaayeh Iran" - literally, No Gaza, No Lebanon, My life is dedicated to Iran" - was first chanted during the 2009 post-election uprising and shocked the regime more than outright calls for the death of the Supreme Leader. Why? because this regime spends more time and money to support Hamas in Gaza and Hezbollah in Lebanon than it does to provide clean water to the residents of south Tehran. The slogan is a direct repudiation of that policy. Sources tell FDI that large crowds chanted anti-regime slogans inside the stadium itself during the June 11 match as well. We will post more video as it becomes available. Watch the video here (Permalink). Regime posts election show polling places: At around 3 PM on Thursday, the regime posted official polling places in the United States for Friday's election. They have been very careful in the PDF tables not to include any identifying markers tying the list of venues back to the regime. One reason may be because two of the 19 locations are Islamic Centers owned and controlled by the Alavi Foundation, which since 2008 has had its assets frozen by federal prosecutors in New York on allegations that it is under the daily control of the Iranian regime. FDI has contacted the prosecutor to flag him of this potentially illegal misuse of assets that are currently under U.S. court-supervised receivership. June 12, 2013: Iranian regime flouts U.S. law, announces 19 election sites across U.S. The Islamic Republic yesterday put up a rudimentary website with similar to graphics to the election website it used in 2009, to inform Iranian-Americans where they could vote in this Friday’s election show. Under U.S. law, it is illegal for the regime to engage in operations outside of a 25 mile radius of its permanent mission to the United Nations in New York, and the Interests Section in the Pakistani embassy in Washington, DC. Tuesday’s announcement that the regime would open 19 official polling stations around the United States was in open defiance of the law. "Staff will have the number of the local police department and will post it" in the polling places in case of incidents," the statement said. The statement also said that staff operating the polling places "will have the official stamp of the Council of Guardians" and will stamp both the individual ballots and the voter's Iranian passport (on page 40). "Keep the official flag of the islamic Republic at the voting table and at the location," it added. Canada is not allowing the regime to operate polling stations, a decision hotly criticized by Tehran. “Canada had deprived many Iranians of exercising their legal right,” a Foreign Ministry spokesman, Seyyed Abbas Araqchi, said in Tehran. “This suggests that the United States government has given its approval to the regime to set up polling stations here in the United States,” said Roozbeh Farahanipour, a pro-freedom activist in Los Angeles. According to a listing published at the regime’s election-show website, six polling stations will operate in California; two in Texas; two in the Washington, DC area; two in the New York city area; and others in Tampa, Philadelphia, Nashville, Chicago, Oklahoma city, Minneapolis, and Milwaukee. FDI urges Iranian-Americans to report these sites to the local FBI and encourage them to shut them down because they are being operated in violation of U.S. law. “Joseph Stalin had elections. That didn’t make the Soviet Union a democracy,” said FDI President and CEO Kenneth R. Timmerman. “The election show of the Islamic Republic of Iran is no different from the sham elections of the old Soviet Union. No one should be fooled. June 5, 2013: Canadian Minister condemns human rights abuses in Iran. In an extraordinary statement, Foreign Affairs Minister John Baird and the Honourable Jason Kenney, Minister of Citizenship, Immigration and Multiculturalism, today commended those who document human rights absues in Iran in an extraordinary statement blasting the "hollow regime" in Tehran for "systematic stifling of democratic freedoms." June 4, 2013: Protestors in Isfahan chant "Death to the Dictator." Protestors at a funeral procession for dissident Ayatollah Taheri Esfahani, who died yesterday at the age of 91, chanted anti-regime slogans through the streets of Isfahan, apparently unchallenged. Ayatollah Taheri, a member of the Assembly of Experts, broke with the regime on June 30, 2009, when he published an open letter calling Ahmadinejad's presidency "illegitimate." • Pastor Saeed Abedini's wife to address UN. Neghmeh Abedini traveled to Geneva, Switzerland where today she will address the UN Human Rights Council, a body on which the Islamic Republic sits. Because her husband is being held in Evin "without a voice," she said, "I must, therefore, be his voice. "Just two weeks ago, the jailed 33-year old pastor, who holds dual U.S. and Iranian citizenship, managed to smuggle out a letter to his wife, expressing his joy that his persecution has helped to unite people from different denominations and different countries. "“You don’t know how happy I was in the Lord and rejoiced knowing that in my chains the body of Christ has chained together and is brought to action and prayer," he wrote. June 3, 2013: White House issues new sanctions but ignores Iran unrest. President Obama today issued yet another executive order imposing new sanctions on the automotive sector in Iran and tightening currency sanctions, while ignoring reports of protests in Isfahan apparently sparked by widening protests in neighboring Turkey. • Federal judge tosses out Mohammadi case. In an opinion issued late on Friday, U.S District Court judge Beryl Howell found that her court lacked juristiction to act against the Islamic Republic at the request of torture victims who were not U.S. citizens. In a statement issued today, Attorney Larry Klayman said he intended to take the torture and wrongful death case of Manouchehr and Akbar Mohammadi to Spain, where courts have handed down judgments against foreign sovereigns in similar cases. Read the full Opinion here. May 27, 2013: FDI to Obama: support the pro-freedom movement. FDI president and CEO Ken Timmerman told the Voice of America that the United States government needs to support the pro-freedom movement in Iran. In comments recorded Friday during a conference sponsored by U.S. Representative Frank Wolf (R-Va), Timmerman told VOA that the Iranian people showed in June 2009 that they were ready for change, but the United States government did not respond. “The United States must do its part and provide active support to pro-freedom groups inside Iran,” Timmerman said. The VOA was reporting on a meeting hosted by the Iranian Solidarity Front, one of an increasing number of political groupings outside Iran aimed at generating support for the pro-freedom movement. (Watch the video). Election update: FDI president Timmerman’s oped on the upcoming Iranian “election show” is here. While Rafsanjani was rejected by the Guardian Council, former Foreign Minister Ali Akbar Velayati would now appear to be Washington’s top choice. Velayati has met on multiple occasions in Qatar and in Switzerland for secret negotiations with U.S. presidential envoy Valerie Jarrett, as first revealed by FDI Strategic Information director Reza Kahlili last October. (Kahlili’s story was picked up by the New York Times and has subsequently been confirmed by senior U.S. and Israeli officials). Former Tehran mayor (and IRGC general) Mohammad Baqr Qalibaf and Khamenei’s top nuclear negotiator, Saeed Jalili, are being touted as the “front-runners” by pro-regime media. Given that the Guardians will deliberate in secret to determine the “winner” of the June 14 election show, right now the only votes that count are Ayatollah Khamenei’s and those of the Guardians. May 12, 2013: Rafsanjani joins the [S]election show. In a much awaited move, f ormer president Ali Akbar Hashemi-Rafsanjani announced today he would be a candidate in the June 14 presidential [S]election, saying that he was only running because Supreme Leader Ayatollah Khamenei had approved his candidacy. His announcement was prominently covered by the BBC and VOA Persian radio and TV services, and undoubtedly provoked a collective sigh of relief inside the U.S. State Department. The Obama administration has intensified the on-again, off-again back-door negotiations with the Islamic regime that every U.S. president has conducted since Jimmy Carter. According to FDI Director of Strategic Information programs Reza Kahlili, U.S. emissaries have met with Khamenei's top foreign policy advisor, Ali Akbar Velayati, more than 10 times over the past few years. Velayati is widely believed to have been Khamenei's hand-picked choice to succeed Ahmadinejad as president. Also in the running are former intelligence minister Ali Fallahian and former Revolutionary Guards commander Mohsen Rezai. All four have international arrest warrants outstanding against them with Interpol for their alleged role in the AMIA bombing in Buenos Aires in 1994 that killed 86 people. The Islamic Republic has engaged in intense diplomacy in recent months to get those arrest warrants removed and pledged to take part in a phony "joint investigation" into the AMIA bombings it claims to be conducting with the Argentine government of President Christina Kirschner. Our take: Rafsanjani undoubtedly waited to announce his candidacy until he had gotten all his ducks in a row, from the Supreme Leader to prominent reformist leaders who hope he can help ease tensions with the United States and the international community. But make no mistake: this man is no reformer, nor is he likely to make any significant changes to the structure or behavior of the Islamic regime. 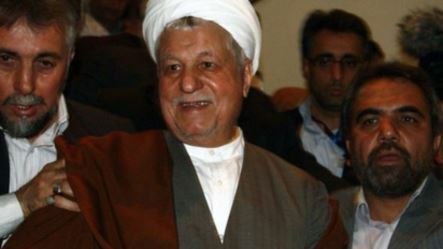 Rafsanjani is the father of the Islamic Republic's nuclear weapons program, having lobbied hard with Ayatollah Khomeini for its resumption when he was Majlis speaker in 1985. As president starting in 1989, he directed the intelligence services to track down dissidents and assassinate them overseas. As head of the Expediency Council he backed the crackdown against the student rebellion in 1999, and remained silent during the crackdown after the 2009 elections. He has never lifted a finger to help political prisoners, ethnic minorities or women, nor has he ever promoted a pluralistic democracy for Iran. And he has made public statements welcoming a "nuclear exchange" [ie, war[ between the Islamic Republic and Israel. And yet, diplomats and leaders in many Western nations seem prepared to delude themselves once again that a smiley face on the Islamic Revolution will remove the threat that this regime poses to the world. Now more than ever, FDI believes it is time to help the Iranian people to raise their voice against dictatorship by demanding that Iran conduct free and fair elections according to the standards the Islamic regime agreed to as set forth by the Inter-Parliamentary Union in 1994. May 10, 2013: Sec. Kerry picks wrong man as AfPak negotiator. U.S. Secretary of State John Kerry announced last week he was appointing James Dobbins as the administration's point man on Afghanistan and Pakistan. Dobbins, who is a pro-Tehran apologist and lobbyist, is the wrong person for the job. His appointment sends a clear signal to Tehran that the Obama administration favors accomodation with a nuclear-armed Iran and will do nothing to compel the regime in Tehran to respect internationally-recognized standards of human rights or the political rights of Iranians. Read a profile of Dobbins at PJ media. May 1, 2013: Update on Ahmadinejad detention. The Director of FDI Strategic Projects, Reza Kahlili, revealed this morning more details about Ahmadinejad's surprise detention on Monday afternoon and his interrogation by the head of Revolutionary Guards Protection and Intelligence Department, Hossein Taeb, and other top intelligence officers loyal to Supreme Leader Ali Khamenei. In his report, featured on WorldNetDaily, Kahlili said Ahmadinejad was warned not to make good on his threats to expose secret information that would embarrass the regime, in particiular a tape he reportedly was threatening to release that documented the regime's vote-rigging on his behalf in the 2009 presidential election. April 28, 2013: Fakhravar pulls a no-show in Paris. Iranian man of all seasons Amir Abbas Fakhravar, who has billed himself as the star attraction in the latest effort to pull together an opposition coalition, failed to turn up at the conference held in Paris this week. The National Council of Iran meetings began on April 27 after an on-line "election" showed that Crown Prince Reza Pahlavi was the most popular Iranian political figure among opposition activists. April 20, 2013: NIAC condemned to pay damages. A U.S. District Court judge has fined NIAC close to $200,000 and dismissed its defamation suit against Hassan Daioleslam, who called the group the "Iranian lobby" in the United States. NIAC and its president, Trita Parsi, repeatedly failed to comply with discovery motions ordered by the court and were found to have altered evidence in an attempt to hide their lobbying activities. The Court's final order was issued on April 9, after its earlier finding against NIAC last September. April 17, 2013: Adopt an Iranian political prisoner. Marziyeh Amirzadeh and Maryam Rostampour have just published Captive in Iran, a gripping memoir of their time in Evin prison, where they were jailed because of their Christian faith. They argue that outsiders can help prisoners in Iran through the simple gesture of writing them letters, a practice long advocated by Amnesty International. Although the regime doesn't actually deliver the letters to the prisoners, they read them - and the more letters that arrive, the more uneasy the authorities become. “That really helped, and it embarrassed the regime. Outside pressure forced them to release us,” Maryam told FDI recently at an event organized by Nina Shea and the Hudson institute's Center for Religious Freedom. The two authors provide the name and address of several prisoners of conscience as well as specific instructions for what to write - and what not to write - in these letters. - Update: Read Ken Timmerman's Washington Times oped, "Taking on Tehran, One prisoner at a time." April 16, 2013: Read the record of the regime's use of torture. Manouchehr Mohammadi provides gripping testimony of the torture he was subjected to in the jails of the Islamic Republic in a federal court hearing in Washington, DC earlier this month. FDI president Kenneth R. Timmerman also testified on the regime's efforts to surveil and intimidate Iranian-Americans. Download the transcript from the hearing. April 8, 2013: FDI joins Stop the Bomb! in calling for protests of Germany's Evangelical Academy for welcoming Iranian regime official. The Lutheran Church's Evangelical Academy in Hannover, Germany, has announced it will host regime ambassador Ali Reza Sheikattar on April 18, to talk about "strenthening Iranian civil society." While FDI opposes granting any Iranian regime official the legitimacy of appearing in public fora in the West, for a church organization to host a regime official is an insult to Christian believers everywhere. Calling evil, good, will not make the evil go away: just ask the Mohammadi's, who suffered the scourge the Tehran regime meets out to those who dare raise their voice in support of freedom (see April 4, below). Not surprisingly, this event is being co-sponsored by the German Ministry of Foreign and Development Aid as a means to promote German exports to Iran, in cynical defiance of international sanctions. German companies such as Siemens have sold surveillance gear to the IRI that has helped them to track dissidents; Mercedes has sold trucks used as missile launchers; scores more have provided nuclear, chemical, and missile technologies. Please join us in sending protest emails to the following persons in charge of this event. (click here to read the FDI email, which you are free to adapt as your own). Learn more about the event from Stop the Bomb! April 5, 2013: Iranian FM threatens Iranian dissidents and activists in Austria. Iranian Foreign minister Ali Akbar Salehi responded with scarcely veiled threats to a small protest during his trip to Austria earlier this year, reminding Iranian Kurds of the regime's assassination of Abdelrahman Qassemlou and threatening Austria with terrorist attacks if it permitted dissidents and European citizens to highlight the regime's terror record. FDI applauds the courage of activist Simone Dinah Hartman and Stop the Bomb! and is happy to partner with them in the U.S.
April 4, 2013: Iranian regime continues to harrass Irania n exiles in the United States. In testimony before U.S. District Court today, FDI president Timmerman detailed the ongoing harrassment by Iranian regime agents in the United States of exiles and political dissidents, as well as the regime's illegal actions in organizing election bureaux around the U.S. for presidential and Majlis elections. "These bureaux operate as offices of the Iranian regime, which is prohibited by law from having a presence outside its two declared representative offices at the UN in New York and the Interests Section in Washington, DC," Timmerman told the court. The goal of these offices is to "harrass and intimidate Iranian-Americans, who depend on the regime for passport, notarial, and other legal services," he added. 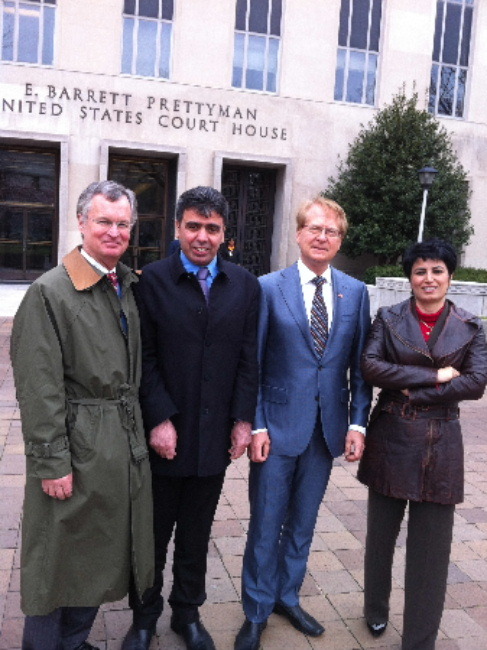 (Photo: Timmerman and attorney Klayman with the Mohammadis outside the courthouse). April 3, 2013: FDI President to testify in landmark human rights case. Kenneth R. Timmerman, President of the Foundation for Democracy in Iran (FDI), will testify on Thursday, April 4, in a historic lawsuit against the Islamic Republic of Iran for its systematic torture of political prisoners. The case, brought by the family of slain Iranian political prisoner Akbar Mohammadi, will be heard before Judge Beryl A. Howell in United States District Court for the District of Columbia. Attorney Larry Klayman is lead counsel for the plaintiffs. Read the complaint here. Timmerman’s testimony, which will include a narrative of his own interaction with Mohammadi’s brother Manouchehr before the two were arrested in 1999, is scheduled to start at 3 PM in Courtroom 15. FDI began using the Internet as a tool for bringing out timely information to document human rights abuses by Iranian regime in the mid-1990s, and was one of the first human rights organizations to publish photographs of the assault by regime thugs on students at the University of Tehran dormitories in July 1999, when the Mohammadis were arrested. Click here to view some of the chronology of that summer’s events. Click here for a PDF version of this press release. March 26, 2013: UN Rapporteur for Human Rights says elections "not free and fair." In an oped appearing on the BBC Persian website, United Nations Rapporteur for Human Rights in Iran blasts the Tehran regime for violating the fundamental rights of Iranian citizens. "[T]he 2009 presidential election and violent post-election events demonstrate that rather than offering an opportunity for people to assert their basic civil and political rights, elections in Iran have seemingly become a time when rights are subdued and choices imposed," writes Dr. Ahmed Shaheed. He blasted the regime for imposing restriction on the choice of candidates for public office, and concluded: "the conditions for free and fair elections are sadly not present in Iran." In a separate statement, Dr. Shaheed said that the regime was intensifying the persecution of Christians, Bahai's, and other religious minorities in Iran, even jailing young Christian women nursing newborn children. “The persecution of Christians has increased. It seems to target new converts and those who run house churches," Dr. Shadeed said. 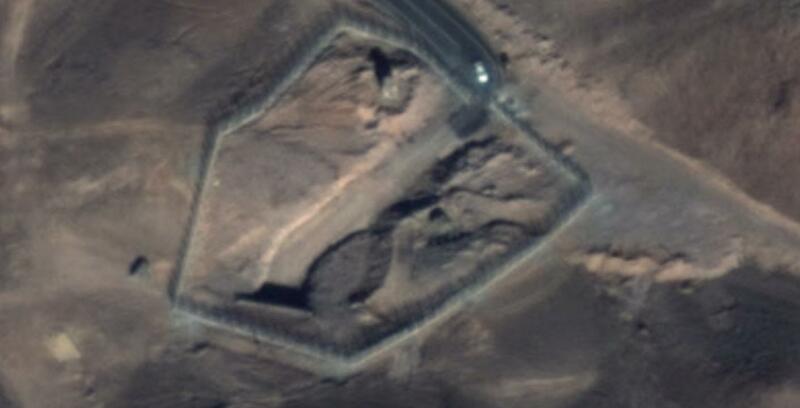 March 24, 2013: FDI reveals 3rd new nuclear site, surrounded by giant ballistic missile field. Stunning satellite imagery, obtained by the director of FDI Strategic Information programs Reza Kahlili, reveals the existence of a previously undisclosed buried nuclear site 15 miles northwest of the Fordow enrichment plant. The new facility, known as "Qods" (Jerusalem), is surrounded by giant missile fields, with more than 380 half buried "garages" for mobile missile launchers that will give the IRGC the ability to "shoot and scoot" with mobile Shahab-3 missiles, just as Hezbollah did during the 2006 war against Israel with smaller missiles. According to FDI sources, the buried facility has the capacity to house 8,000 uranium enrichment centrifuges, although it's not known at present how many - if any - have been installed. FDI invites analysts and government officials to use the coordinates posted near the end of the video (click on the image at left) to corroborate this information using Google Earth and classified imagery. The enhanced video clearly shows that the dedicated high tension lines bringing power to the underground Qods facility as well as the extensivve perimeter fence and the vast missile fields. March 22, 2013: Kerry exposes Iranian family tie. In a stunning admission right up front in what has become a pro-forma Nowruz greeting to the Iranian people, Secretary of State John Kerry exposed a secret journalists and academics have been agonizing over for the past month: the fact that his daughter has married an Iranian-American who has extensive family ties to Iran. "I am proud of the Iranian-Americans in my own family, and grateful for how they have enriched my life," Kerry said in his NowRuz greeting, Kerry also said he was "strongly committed to resolving" the differences between the United State and the Islamic Republic of Iran, "to the mutual benefit of both of our people." Politicians like to keep their family's off limits to the press, a decorum enforced vigorously when it comes politicians in favor with the national media but ruthlessly discarded for others. But in Kerry's case, there could be larger ramifications. Since its inception, the FBI has vetted U.S. government officials involved in national security issues, and generally rejects granting clearances for individuals who are married to nationals of an enemy nation, or who have family members living in that country, for fear of divided loyalties or more simply, blackmail. Behrouz (Brian) Nahed and Vanessa Kerry Nahed are both residents as Mass General in Boston. An Iranian government website first published pictures of the married couple in February, just as Kerry was up for confirmation hearings before the Senate Foreign Relations Committee. Dr. Nahed's family lives in Los Angeles, but he has relatives still in Iran. The Iranian website reported that shortly after their marriage the young couple visited those relatives in Iran. Was the Iranian publication itself a subtle form of blackmail, aimed at letting Kerry know that the regime is fully aware of his son-in-law's extended family in Iran? The Islamic Republic systematically puts pressure on family members of prominent Iranian-Americans (for example, individuals who work at the Persian service of Voice of America), to make sure that they do not engage in hostile statements or activities against the Tehran regime. Certainly, Secretary Kerry has long favored a U.S. rapprochement with the Islamic Republic. He has repeatedly appeared with groups such as the American Iranian Council (AIC), and has taken money from Iranian-Americans for his political campaigns, including at least one illegal donation from an Iranian woman in 2002 who did not have a green card. So he didn't need to have an Iranian-American family member to believe that the United States should forge direct relations with the Islamic Republic or ease U.S. pressure on the regime. Kerry may have figured that by revealing the family tie himself he could diffuse the situation, and make it more difficult for the regime to put pressure on his son-in-law's family - of course, assuming that as Secretary of State, Kerry in fact plans to do anything that angers the regime. But what if the regime simply decides to round up Nahed's family members and torture them? Or sends its goons to visit them at home? Or exerts some form of more subtle pressure on them that gets no publicity, and then makes it known they want the United States to release Iranians jailed in the United States on terrorism charges or for attempting to procure weapons technology or military spare parts? Should Congress be asking Senator Kerry how he would respond in such a case? March 1, 2013: Regime ayatollah issues fatwah against opposition figure in exile. Senior Iranian cleric Ayatullah Nasir Makarem Shirazi has issued a fatwa against Roozbeh Farahanipour, the founder of Marzepor Gohar, a nationalist opposition grouop active in Iran. 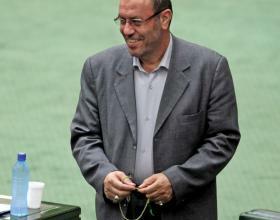 Farahanipour was jailed in 1999 for his role in heloping to organize the July 1999 student revolt. Ayatollah Shirazi is infamous in Iran for his fatwas against dogs, his calls for death by stoning for adulterers, harsh punishment of homosexuals, and repeated anti-Semitic statements. Feb. 26, 2013: London conference brings Balouchis together. 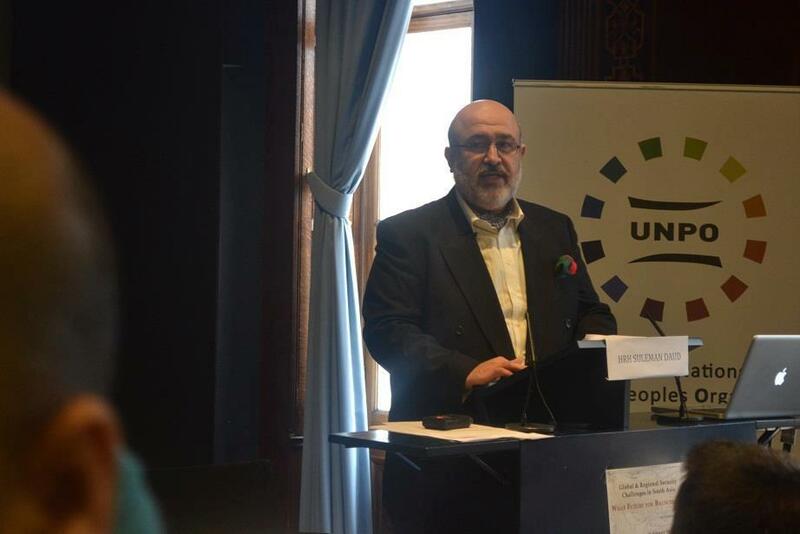 Leaders of Balouchi groups in Pakistan and Iran joined together at a one-day conference in London at the Royal Society put together by the Unrepresented Nations and Peoples Organization (UNPO). The main focus was on Balouchis in Pakistan, with Mir Soleiman Daud, the Khan of Kalat, calling for Pakistani Balouchis to form a united front to pressure the Islamabad government for their rights. Also presenting were Nasser Boladai, President of the Baluchistan People’s Party, and Hammal Haider Baloch, spokesperson of the Baloch National Movement. U.S. Representative Dana Rohrabacher (R, CA), called for the Pakistan government to allow a referendum on Balouchi independence, adding to his previous calls for separatist movements in Iranian Kurdistan and Azerbaijan. For more details, go to the Baloch Human Rights Council Facebook page. - A separate story from Breitbart.com about a 2009 report Hagel co-authored calling for U.S. Troops to deploy as part of a multinational force on Israel’s borders to impose peace on Israel and the Palestinians. is now scheduled for Tuesday, Feb. 26. Feb. 18, 2013: Steady drip-drip exposes Hagel's ties to Tehran. Bit by bit, it's all coming out. The DailyCaller today reveals that Hagel's speech at Rutgers in 2007 was at Tehran-funded Middle East studies unit headed by prof who boasts on his CV of getting funding from the Alavi Foundation, the Iranian regime's biggest U.S. front organization. The feds busted Alavi in 2008 after uncovering a treasure trove of documents in a series of court-ordered search warrants that showed Tehran was directly managing its day-to-day affairs. (FDI first disclosed the photo at the top of this website, taken during yet another Hagel speech with Amirahmadi in 2007, on a deep dive of Internet archives). Though he portrays himself as a reformist, Iranian-Americans who follow him describe him as a "Rafsanjanist" eager to make the regime's case in Washington. In 2009, the New York Post quoted Mr. Amirahmadi as saying that "Iran has not been involved in any terrorist organization," and that "neither Hezbollah nor Hamas are terrorist organizations." Stephens notes that Amirahmadi "makes no secret of his political leanings and ambitions. Did nobody on Mr. Hagel's or the [Senate Intelligence] Committee's staff vet his speaking gigs before he gave them?" Feb. 11. 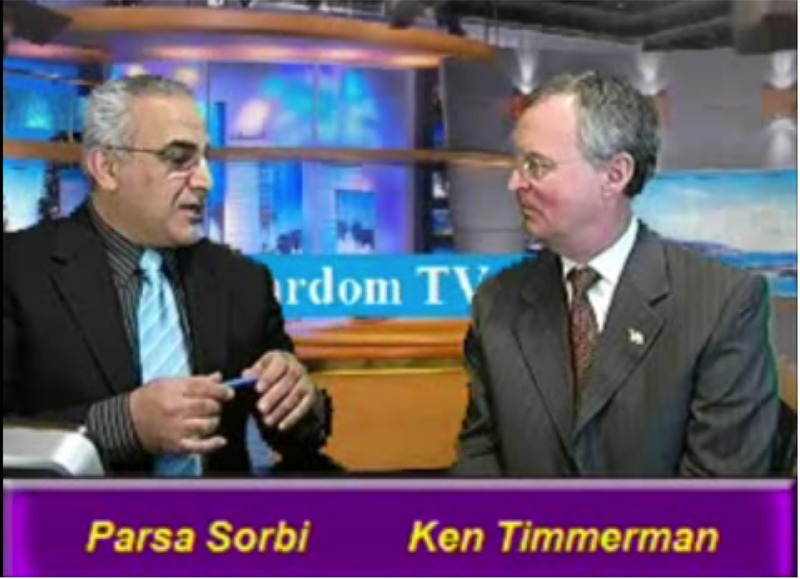 2013 – Join Ken Timmerman on MardomTV today at 2 PM Eastern. FDI president Ken Timmerman will join Parsa Sorbi to talk about Sunday’s protest against auto-makers such as Mercedes and Nissan who refuse to leave Iran, and the Obama administration’s new national security and foreign policy team and the prospects for US-Iran talks. Join him online today at 2 Eastern time. Feb. 10, 2013 – Baltimore Jewish Times covers auto-show protest. Click here for a preview of Sunday’s rally in front of the Baltimore convention center. 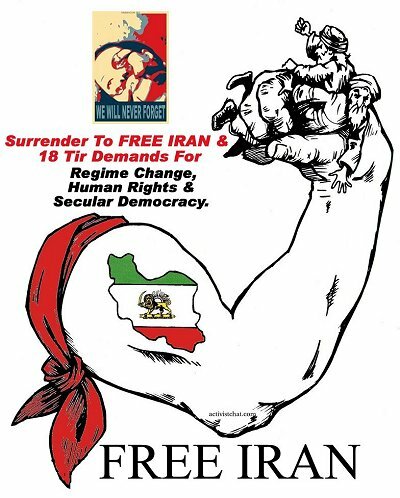 Feb. 8, 2013: Join FDI this Sunday in Baltimore to protest rogue auto companies still dealing with the Tehran regime. FDI is joining UANI, the Baltimore Zionist District, the Endowment for Middle East Truth and a host of others to call on major auto makers (Nissan, Daimler Benz, BMW) to get out of Iran. Download the complete flyer with meeting info. - Could Hagel be toast? That's what former federal prosecutor Andrew C. McCarthy thinks. Contributing to Hagel's problems: ties to Hamas, ties to NIAC, and ties to Amirahmadi. FDI's information brief on Hagel and the pro-Tehran lobby has been gaining traction. - New satellite photos show possible emergency activity at Fordow nuclear site after alleged explosion. The Digital Globe satellite photo at right, obtained by WorldNetDaily, shows what appears to be a mini-van entering through one of the security gates to the underground Fordow nuclear complex on Jan. 21, the day of the alleged explosion. More photographs with a detailed explanation by FDI Strategic Information coordinator Reza Kahlili can be found here. Michael Ledeen wrote today that his own sources in Iran are confirming the explosion. Even more intriguing is a Jan. 27 report from a UPI correspondent embedded in this account that says the explosion was so powerful it was felt in a three mile radius, while local sources complained about the "imposition of a 15-mile no-traffic zone, and hours-long closure of the Tehran-Qom highway." Feb. 6, 2013: New video details the problems with Hagel. Jan. 30, 2013: FDI President makes the case against Hagel. In a column published in today's Washington Times, Ken Timmerman argues that Hagel's policies toward the Islamic Republic regime in Iran should disqualify him to become Secretary of Defense. Jan. 28, 2013: Letter against Hagel. FDI and prominent national leaders issued a joint letter, calling on members of the U.S. Senate to reject the nomination of former Sen. Chuck Hagel to become secretary of defense. While “[w]e honor and appreciate Mr. Hagel’s service to our nation… we are deeply concerned by Mr. Hagel’s record and views on a broad range of national security issues, and we fear that his confirmation as defense secretary would send a dangerous signal to our enemies about America’s willingness to do what is necessary to defend ourselves and our allies,” the letter states. Joining FDI on the letter are Frank Gaffney, president of the Center for Security Policy, Morton Klein, president of the Zionist Organization of America, and Sarah Stern, president of the Endowment for Middle East Truth. The full letter is available here. FDI has made available to Senate offices a detailed Fact Sheet on Sen. Hagel’s record when it comes to Iran. We are disturbed by Hagel’s confirmation day “conversion” when it comes to a wide range of serious issues related to Iran, since it contradicts a consistent track record over the past dozen years where Hagel has repeatedly rejected any U.S. pressure on the Islamic regime in Tehran, whether over its nuclear program, its support for terrorism, or its human rights abuses. Jan. 21, 2013:Attorney who won Iran-9/11 case dies. FDI president Ken Timmerman joined the family and friends of Thomas E. Mellon, Jr. over the weekend in Doylestown, Pa, to celebrate the life of the man who won a historic judgment against the Islamic Republic of Iran for its involvement in the 9/11 attacks (Havlish et al v. Osama bin Laden et al). Timmerman was the lead outside investigator in the case that Mellon and his team of attorneys argued successfully before U.S. District Court for the Southern District of New York in December 2011. Read an official obituary here. ,attorney Jack Corr; back row: attorney Donald Winder, attorney Evan Yegelwel. For more photos of Mellon and the Havlish case, visit Ken’s Facebook page. Jan. 17, 2013 - FDI President takes Hagel objections to Congress. FDI shared its objections with the nomination of Sen. Chuck Hagel to become Secretary of Defense with Senators and Congressional staffers on Capitol ill this week. Here, at a forum hosted by the Endowment for Middle East Truth (EMET), Timmerman pointed out that Hagel's nomination has been welcomed by the Islamic Republic's official media. Video coming soon. 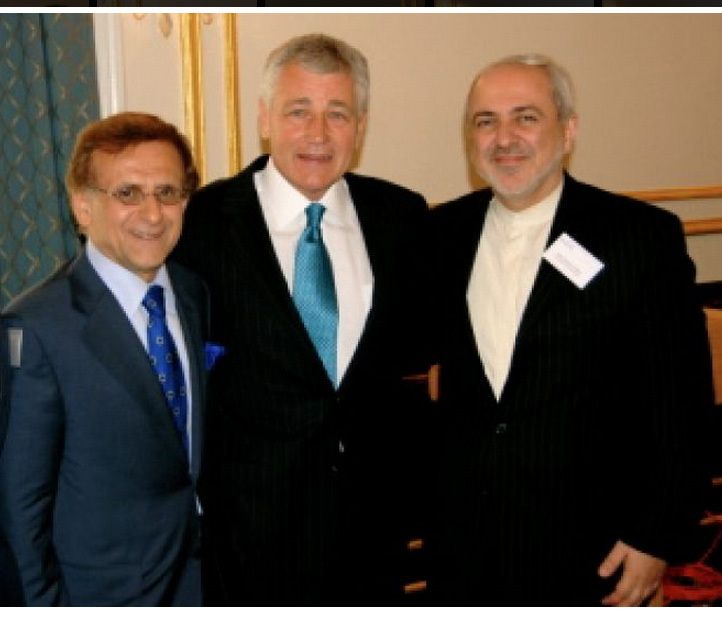 - Read the facts about Chuck Hagel and his long-standing ties to the pro-Tehran lobby. From that page, you can also download FDI's background briefing on the Hagel nomination and what it signifies for U.S. deterrence, Iran, and U.S. national interests. Jan. 16, 2013: IRI confirms death sentences against 5 Ahwazi Arabs. The Iranian supreme court this week confirmed the death sentences of five Ahwazi Arab political activists. Read more from Sharif Behruz and the Ahwaz Human Rights Organization. Jan. 12, 2013: What's behind the triple Murder of Kurds in Paris? Amir Taheri dives into this Parisian murder mystery. His prime suspects? A Syrian government hit team, an Iranian-backed Hezbollah hit team, or PKK dissidents unhappy with ongoing negotiations between PKK leader Abdallah Ocalan and the Turkish government. Jan. 11, 2013: Join FDI President & CEO Ken Timmerman on Mardom TV. Ken will be talking about FDI's opposition to the Hagel nomination, about t he Pentagon's latest report on Iranian regime intelligence operations in the United States, and much more. Update: complete video is now available. Jan. 10, 2013: FDI Announces its Opposition to the Hagel nomination. The Board of Directors of the Foundation for Democracy in Iran today released a detailed memo in opposition to Sen. Chuck Hagel's nomination to become U.S. Secretary of Defense. The FDI memo includes excerpts from Hagel's own statements on Iran, and new details of his relationships to the pro-Tehran lobby in Washington, DC. It also includes new information on Hagel's efforts as a private citizen in 2009 to lobby the Russian government against joining a State Department-led effort to step up pressure on Iran. "Over the past four years, Congress has helped steer the U.S. administration toward policies that have increased the pressure on the Islamic regime in Tehran, while expanding on work done by the two previous administrations to build an international coalition to slow down the emergence of a nuclear-armed Iranian regime," FDI wrote.
" FDI has never called – and is not calling today – for U.S. military strikes on Iran. However, for U.S. military power to have any impact on decision-making in Tehran, the Islamic Republic leadership must believe in U.S. resolve. Senator Hagel’s confirmation as Secretary of Defense would send a message of weakened U.S. resolve to the leaders of the Islamic Republic, which could serve as an inducement for aggressive behavior. For these reasons we urge the Senate to reject Senator Hagel’s nomination." Read the full statement, with hot links to original sources and documents and additional photos. Download a 2-page PDF version. - Protests planned across Europe, Canada against bloggers' execution. Human rights activists have planned a series of demonstrations in Europe, starting tomorrow, to protest the impending execution of bloggers Loghman and Zanyar Moradi, who have been in jail for the past three years. For people living in the U.S. and Canada, you can sign an on-line petition to Catherine Ashton, the European Union's top diplomat, asking for the EU to add its voice to those calling on the Islamic Republic to release the Moradi's and other political prisoners. Click here for the list of demonstrations. Read Zanyar Moradi's letter from prison. Jan. 9, 2013: FDI joins call to investigate al Jazeera. FDI is proud to join forces with pro-freedom advocates, journalists, and national security experts in calling for a Congressional investigation of al Jazeera, in the wake of the pro-jihadi media group's growing investments in the United States. Read the announcement. Read the letter. Jan. 8, 2013: FDI Salutes New York State Assemblyman Bill Nojay. FDI is proud to salute our board member Bill Nojay as he is sworn in today to his new duties as a newly-elected State Assemblyman for the 133rd district of New York. 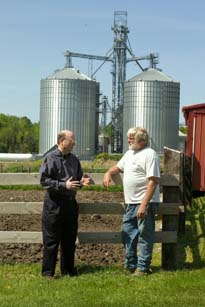 In addition to his popular radio show, his thriving international law practice, and his extensive volunteer work (that includes long years of democracy promotion around the world, in addition to working with his local fire department as an EMT and ambulance driver), Bill has been working with FDI for the past five years to help the pro-freedom movement in Iran. We invite you to read more about Bill's action-packed career, and join us in saluting him as he sworn in today. Send Bill a message of support! Jan. 7 , 2013: Support FDI while enjoying the spectacular Shen Yun music and danse performance at the Kennedy Center. Visit our special page to learn more about this amazing dance troop or book your tickets directly. After choosing your seats, make sure you apply the Promo code "KTKC" so FDI will get credit for your purchase. We thank the Shen Yun Performing Arts company for their willingness to support our cause with a percentage of the ticket sales for the Jan. 31 performance. Jan. 6, 2013: More Complaints about VOA Persian Service. The Wall Street Journal today published a stinging criticism of VOA's Persian service for continuing to give voice to pro-regime "experts," while frustrating the pro-freedom movement. This waste of U.S. taxpayer dollars must be reformed - or shut down. send us your e-mail address. FDI needs your support! To continue to bring you the type of news and human rights reporting you have come to expect, we need your help. Click here for information on how to make a contribution. Remember, all money donated to FDI is 100% tax-deductible.